There is no doubt that Ben Stiller and Jack Black are funny actors, and Barry Levinson has shown in the past that he can helm a hilarious movie. Envy is not that movie. Here is a case or reverse synergy, where the sum of the parts is a lot less than the whole. A whole lot less. Envy is a giant mess of a movie. Everybody is running around with little or nothing to do because the film has no real point. Well, supposedly the film is about envy, specifically from one neighbor to another. But things quickly devolve into a long, strung-out series of events that brings out the annoying qualities of Stiller, Black, and Christopher Walken. At the beginning of the film, the neighbors, the Dingmans and the Vanderparks, are great friends. 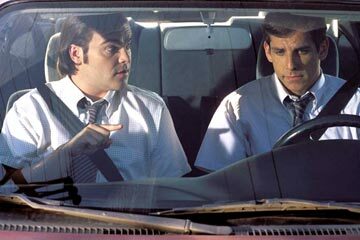 Tim Dingman (Stiller, Starsky & Hutch, Along Came Polly) and Nick Vanderpark (Black, School of Rock, Ice Age) even car pool to work together. Nick is always dreaming up crazy ideas for inventions that make no sense, so Tim usually ignores him. Nick's latest idea is for Vapoorize, something you can spray on doggie-doo to make it vanish. Tim thinks it's another lame idea and decides not to help Nick fund it, only to see it take off. Nick builds a mansion complete with merry-go-round, archery range, and indoor bowling lanes over his old house, so Tim can look out the window and see what he could have had. His wife Debbie (Rachel Weisz, Runaway Jury, Confidence) constantly reminds him of what he missed out on. So Nick's not feeling to well, and in a drunken stupor, goes and accidentally kills Tim's horse. So now, in the span of two movies, Stiller has shot a white horse both with a gun and with an arrow. Nice. Feeling guilty, he tries to cover up the crime, and of course, things snowball from there. He enlists the help of the J-Man (Walken, Man on Fire, The Rundown), a weird bum he meets in a bar. It's the J-Man that usually gets Tim into even more trouble. All the while, Nick has no idea that Tim feels this way. Steve Adams, who wrote the screenplay, spends most of his time having Stiller run around trying to cover up more things. It is a tedious affair, and for a comedy, there is precious little that is actually funny. The concept is not even that funny. The worst part is the talent involved here. Levinson (Bandits, An Everlasting Piece) is working with some great actors. 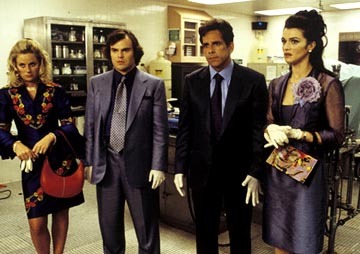 But, as mentioned before, the script focuses on the aspects of Stiller and Black than can get annoying. Both are essentially playing roles that are similar to other roles they've had, but with a lack of substance in the script, their thin portraits (the frustrated Stiller and the over-enthusiastic Black) just do the same thing repeatedly in the film. And Walken? Maybe he's hard up on money lately. He is taking way too many roles that have him playing a parody of himself. Sure it was funny a few times, but it's beginning to get ridiculous. 1 hour, 39 minutes, Rated PG-13 for language and sexual/crude humor.